The Land is one of my favorite places in all of Walt Disney World. In fact, it will have its own tribute post coming soon! For now, though, I'm posting the beginning of my Kalanchoe Chronicle. "Mickey's Mini Gardens" are sold in The Land pavilion, at the desk next to Soarin'. These are tiny plant tissue cultures, cultivated from the greenhouse inside The Land. A few varieties are available. I selected a kalanchoe, based on my understanding that this will be a hardy variety! Inspired by the fine folks at Main Street Gazette, I'm chronicling my attempt at growing this kalanchoe on the Plus the Magic Facebook page. If you've not already visited & liked our page, please do so! You can find our Facebook page here. The Land Pavilion, located in Epcot's Future World West, is home to some of my favorite attractions. In addition to the ever-popular Soarin', the pavilion also houses Living with the Land, an agricultural boat ride tour through a fantastic working greenhouse. Sunshine Seasons- one of my favorite quick service eateries- can also be found here. Just outside of the Soarin' entrance on the lower level, you'll find a counter where you can sign up for Behind the Seeds, a backstage tour of the greenhouses. (I highly recommend this tour- watch for a post dedicated to Behind the Seeds coming soon!). It's here that you will find a display for Mickey's Mini Gardens! These tiny plant tissue cultures, propagated right here in The Land pavilion, are growing in an agar gel and are sealed in glass. The instructions included in the box will give you information on how your plant came to be, as well as how to transplant and grow it. Out of the box and ready to grow! 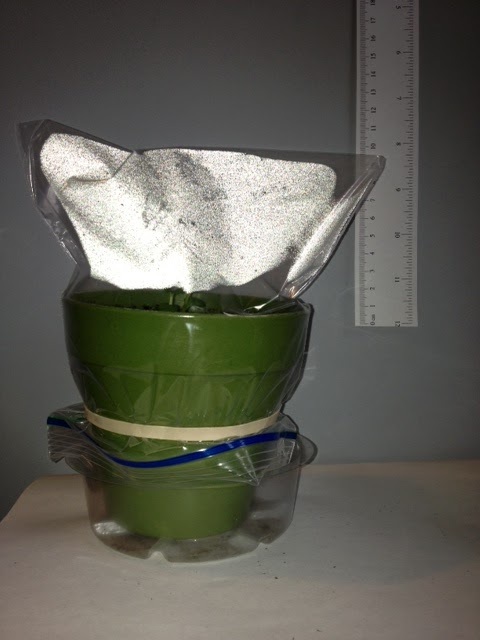 The first step was to prepare a small pot, using a good quality potting soil. Next it was time to take the little guy out of the glass jar. This was not as easy as I thought it would be. The gel was much firmer than I expected, and I needed a spoon to coax it out. I lost one tiny green leaf in the process. 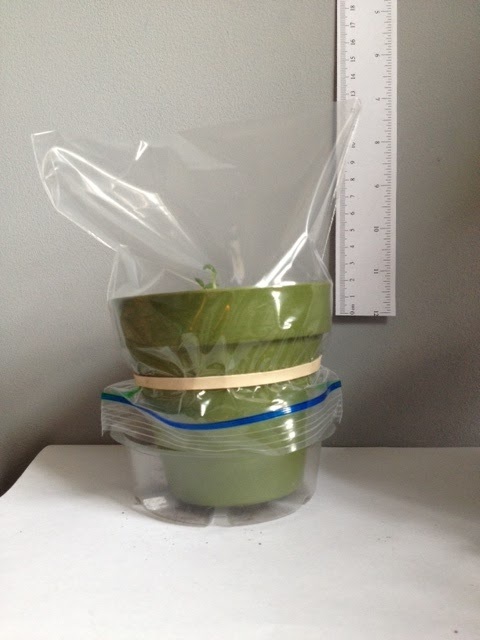 Once planted, a plastic bag is put over the plant to maintain humidity. This will stay on for the first few weeks, and holes will be added shortly to increase air circulation. I hung a ruler next to the kalanchoe, so we can (hopefully) measure growth as the weeks go by. After one full week, the kalanchoe seems to be doing fine. There's no discernible growth yet. The photo on the right was taken with a flash, so that the humidity inside would be visible. To follow along on The Kalanchoe Chronicle journey, please visit our Facebook page! Thanks for joining us. Good luck!! I'm sad to say, mine didn't make it. I gave it a valiant effort, but it never got strong enough to survive after transplant. I know others have had great success, and I hope yours takes root and flourishes!